At the Joe Andruzzi Foundation, positivity encapsulates everything we stand for. It’s our philosophy, our commitment, and the promise we make to ourselves and each other. Joe’s upbeat, positive attitude helped him conquer the toughest challenge in his life, non-Hodgkin’s Burkitt’s lymphoma. We’re now dedicated to spreading our (Up)Beat approach to cancer patients and families throughout New England, New York, and New Jersey, encouraging them to live each and every day with positivity and a smile. We’re always ecstatic to find others that share our commitment to positivity in cancer care. The American Humane Association (AHA) recently launched a large-scale clinical trial testing the benefits of canine therapy for pediatric cancer patients. Their findings support a large body of interest in animal-assisted therapy (AAT), which reportedly shows an improvement in the physical and psychological well-being of patients who spend time with animals during recovery. Currently backed by a nearly $1 million grant from the Pfizer Foundation and Zoetis, a global animal health and medical company, AHA’s groundbreaking clinical trial is the first of its kind to document the therapeutic benefits of ATT. 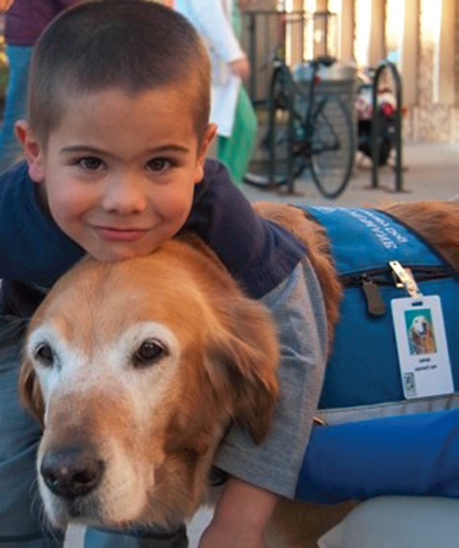 Five leading children’s hospitals around the nation will participate for 12 months, tracking blood pressure, heart rate and psychological responses in the kids, their families, caregivers, and the therapy dogs themselves.